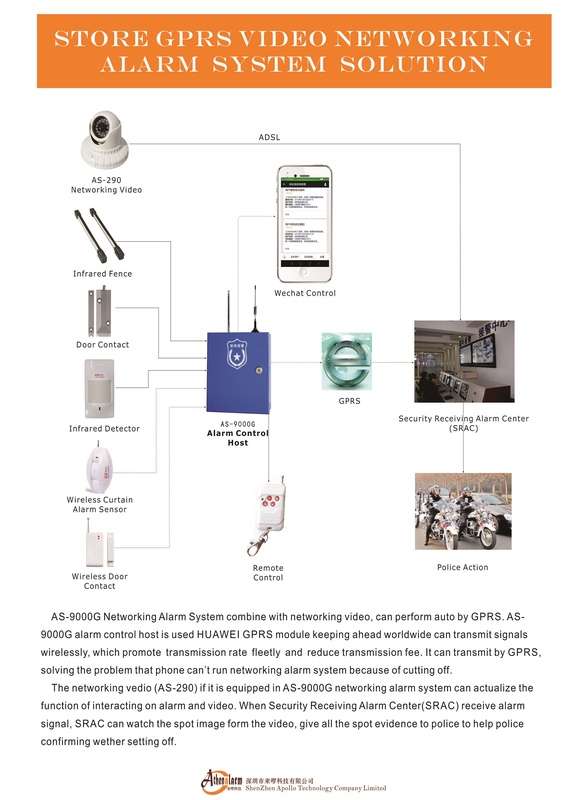 AS-9000G Networking Alarm System combine with networking video, can perform by GPRS.AS-9000G alarm control host (include: AS-9000GPRS alarm control host & AS-9000G alarm control host) is used HUAWEI GPRS module keeping ahead worldwide can transmit signals wirelessly, which promote transmission rate fleetly and reduce transmission fee. It can transmit by GPRS solving the problem that phone can’t run networking alarm system because of cutting off. The networking vedio (AS-290) if it is equipped in AS-9000G networking alarm system can actualize the function of interacting on alarm and video. When Security Receiving Alarm Center (SRAC) receive alarm signal, SRAC can watch the spot image form the video, give all the spot evidence to police to help police confirming wether setting off.